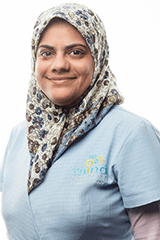 Fatimeh, a qualified early childhood educator, specializes in Special Education and comes with 12 years of experience. Fatimeh is a dedicated teacher, passionate about contributing to the intellectual, social, emotional and physical development of young children. She is an enthusiastic, creative and a caring teacher, versed in learning theories and practices. She holds a Master’s Degree in Child Care and Education, and has completed Teachers Training in Special Education from British Council UK and a diploma in Child Psychology from Stonebridge University UK. Being an active member of NASET (National Association for Special Education Teachers) Washington USA, she has completed various professional certificate courses in ADHD, Autism, Autism: Criteria for determining eligibility for Special Education, Behavior Problems: Intervention Strategies, how children are identified for special education services and more. She has also trained in Low Vision Rehabilitation and has completed certificate courses from Hadley School for The Blind, USA. She has designed an online consultation program called ‘CHIILD’ that delivers customized services to meet various needs of children. Fatimeh is now doing her research work on the importance of storytelling and its impact in special education, and has been an active participant in various national and international seminars and conferences. She was awarded the First International Excellence Award for Service to Disabilities in August 2017 by the Ministry of Social Welfare, India.